A Maryland man has sued Six Flags America, arguing guards beat him as he left the park after a disagreement this summer. Nicholaus Mims, who is black, sued in a Maryland court seeking $10 million in damages for assault, battery and false imprisonment. Mims says his son wandered from a water park, and he looked for him in other sections. He found his son, but security guards told him he needed to put on a shirt. Mims said after an argument where he used a profane word out of frusteration, he agreed to leave. He says guards followed him out of the park and tried handcuffing him. The lawsuit alleges they slammed him to the ground and beat him. 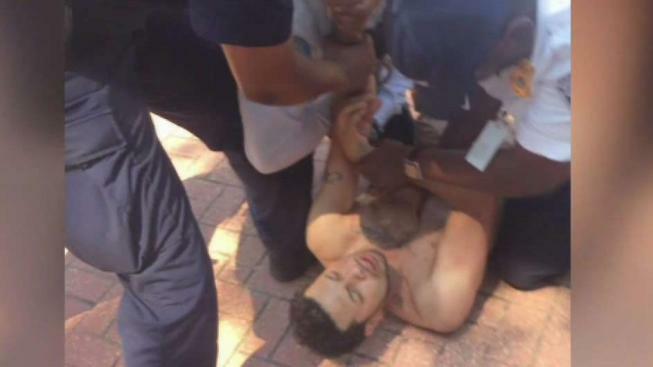 A photo shows Mims on the ground with a security guard's hand on his throat. At least two other guards stand over him. He said his wife and two sons were there. "Humiliating isn't even the word," he said. Mims says he suffered a concussion and other injuries. The guards took the situation too far, his lawyer said. "Their training should require for these private officers is that they use every attempt possible to de-escalate the situation," Governor Jackson, Mim's attorney, said. Six Flags spokeswoman Denise Stokes says the company believes the lawsuit has no merit. Company lawyers have denied his allegations in court.